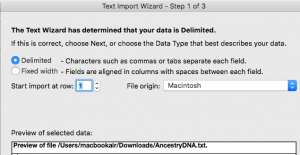 A quick tutorial for today on downloading your data from AncestryDNA. Why download your data? Well, it is YOUR data — genetic data about you that you paid for… If you download it from AncestryDNA, then you can use that data in a variety of ways. You also don’t have to worry about the company going out of business or cutting off access to the download file. 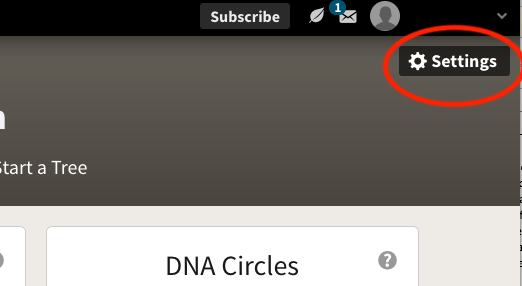 Step 3) Click the Download Raw DNA Data button. Step 4) Read, check the acknowledgment box, and then enter your password again. 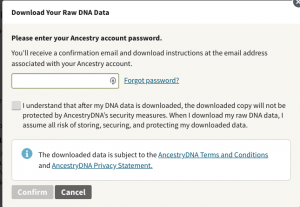 Step 5) Wait for an email from AncestryDNA with a link to download the file. 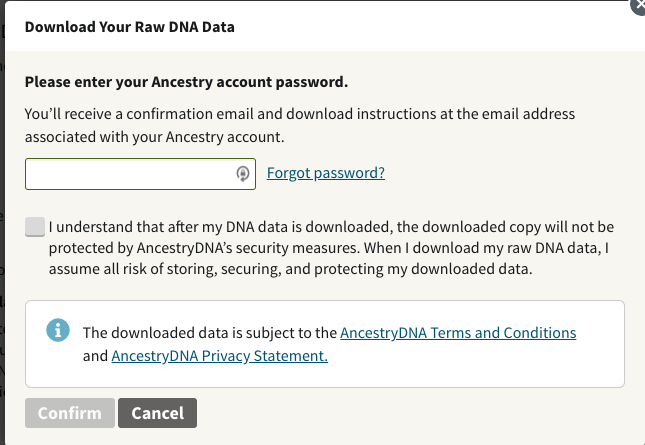 Step 6) Click the link in the email from AncestryDNA. It will take you to the page to download your data. Step 7) Your DNA Raw Data file will download as a .zip file to your default downloads directory. For most computers, you can just double-click to unzip the file. I suggest saving it to another folder and also to an external or backup drive so that you don’t lose the file. While you can unzip your raw DNA data file and look at it using a text editor (Notepad, TextEdit, etc), I find it easiest to import it into Excel for searching and keeping notes on what I’ve learned about a particular gene. Before you ask… no, you cannot import it into Google Sheets. The file has too many rows. 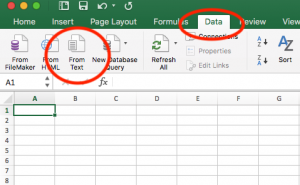 There are several ways to import a text file into Excel, so if the directions below don’t quite match up with your version of Excel, you can always do a quick Google search for alternatives. Step 1) Open up a new workbook and select the Data tab. Click on the From Text icon. 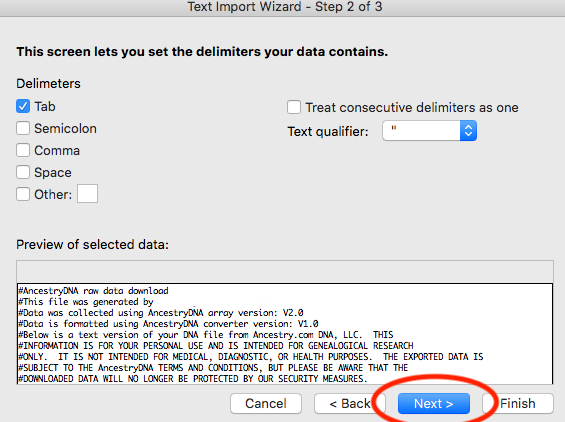 Step 2) Select your raw DNA data file. (It is probably named AncestryDNA.txt.) 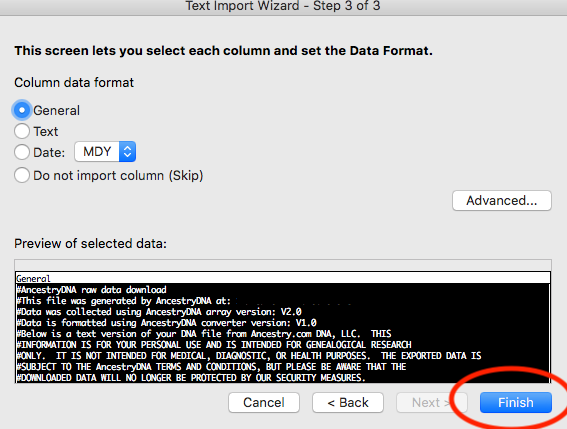 Then you will see the data import wizard. 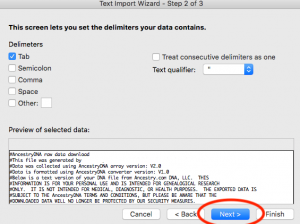 Step 3) The next couple of screens in the Text Import Wizard should all have the right default values already chose for your tab-delimited text file. You will just need to hit “Next” and then “Finish”. You can put the data into your existing blank worksheet. Step 4) It may take a minute for the text file to be imported. It is almost 700,000 rows of data. Be patient. Don’t mess with Excel while it is importing. 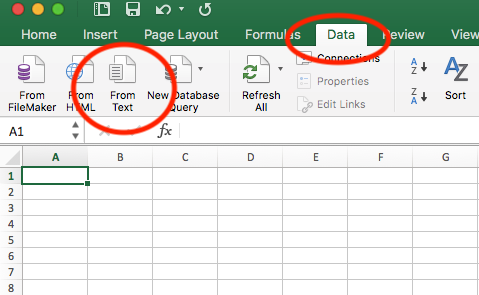 Step 5) Now you can search your data using the Find command in Excel. Go ahead and give it a try. Look for rs4988235. If your results show a G and a G for your genotype, you are likely lactose intolerant (or not producing lactase) as an adult. Read the Lactose Intolerance article for all the details. Are you a carrier for hemochromatosis?